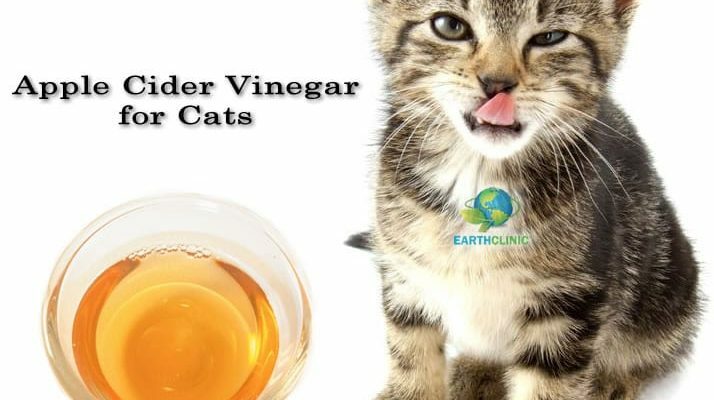 Apple cider vinegar is a natural remedy that you will want to keep on hand if you own cats! It is a “go to” home remedy for numerous health conditions in pets, including cats. Apple cider vinegar is used internally and externally for a wide range of conditions your cat will likely face at some point in his life, including fleas, urinary tract disorders, and ear infections. What Kind of Apple Cider Vinegar Should I Use for My Cat? When it is used for health purposes, raw and organic apple cider vinegar is the best kind of vinegar to use. It is available online, at health food stores, and in larger grocery stores. How Do I Use Apple Cider Vinegar Externally for My Cat? Apple cider vinegar must always be diluted when it is used externally for your cat. A typical dilution is 1/2 cup apple cider vinegar and 1/2 cup pure water (spring or distilled.) To use it topically, put the solution in a jar or a spray bottle. Avoid getting this solution into your cat’s eyes. Your cat may not be fond of the smell or taste of apple cider vinegar, but it is a safer option than many medications for a number of conditions. If you use apple cider vinegar on your cat and she licks it off during grooming, that is fine. It is safe internally for your cat as well. The above solution of vinegar is useful sprayed onto the fur of cats to repel fleas. If being sprayed from a bottle is distressing to your cat, apply some of the solution to a paper towel and wipe your cat’s fur with it. A cotton ball can be dipped into the solution and applied to the back of the neck to repel fleas or treat infection as well. For infections on broken skin, ringworm or pinkeye, use 2 teaspoons of apple cider vinegar in one cup of distilled or spring water. Apply this solution to the scruff of the neck twice a day. For ear infections, mix 1/2 tablespoon raw apple cider vinegar with 1/2 tablespoon rubbing alcohol. Drop a few drops into each ear twice a day. If ears are “gunky” use the solution on a cotton ball to wipe out the visible part of the ear. How Do I Use Apple Cider Vinegar Internally for My Cat? Apple cider vinegar can be mixed into your cat’s wet food twice a day. Alternately, you can add apple cider vinegar to your cats drinking water. Add 1/2 – 1 teaspoon to a cup of water. If your cat does not like this, try adding a pinch of baking soda to the water with the apple cider vinegar. The baking soda will reduce the acidity of the vinegar. Apple cider vinegar is used internally for cats with bladder problems, urinary tract infections, respiratory infections, allergies and asthma. Internal use may also repel fleas and other parasites. Have you tried apple cider vinegar for your cat? We would love to hear about your remedy! Read on to see how many of our readers have used apple cider vinegar for their cats. Watch Earth Clinic’s video demonstrating how to apply a topical solution to your cat or dog. It’s gentle and your cat will love you for it! My male cat is having flu, cough and badly sneezing with runny nose.. Is apple cider vinegar good for this flu? My cat was having a terrible time with runny stool and had lost about 3 lbs. After several weeks of on again off again diarrhea, trips to the vet, blood work, antibiotics and probiotics- he was given a dx of IBD. I read about 1/4 tsp of ACV in 8 oz of water and started him on 2 syringe fulls a day- within 24 hrs the diarrhea had stopped and he is now on one syringe a day and is doing great!